Postgres is the gift of timesuck. It’s a great database, especially for spatial data. However, without insider knowledge, simple tasks eat time. Latest example: pg_upgrade. It shrinks upgrade complexity–if it works! For Windows users, the documentation has useless and incomplete steps. Install 9.4 with the Windows installer. Don’t let it use TCP port 5432 yet; that’s used by your current Postgres install. The installer saw this and recommended 5433. Add needed extensions with the Application Stack Builder. If you use PostGIS, don’t install the sample database. Do nothing else with the new install. With the Services control panel, shut down both the old and new databases. With Windows Explorer, give the Windows postgres account Full Control permission on C:\Program Files\PostgreSQL\ and all children. In the new command prompt window, run this: pg_upgrade.exe --old-datadir “C:/Program Files/PostgreSQL/9.3/data” --new-datadir “C:/Program Files/PostgreSQL/9.4/data” --old-bindir “C:/Program Files/PostgreSQL/9.3/bin” --new-bindir “C:/Program Files/PostgreSQL/9.4/bin” This will take a while to run if you have a lot of data. Wait until this is done before continuing. Edit the postgresql.conf file for the new Postgres install and change the listening port to 5432 (from 5433). Through the Services control panel, start your new Postgres install back up. Vacuum and reanalyze all databases. If you created a postgres Windows account above, remove it. The new Postgres install’s postgres database account (not the Windows account) will now have the same password as in the old Postgres install. Once you’ve verified that everything works properly, it may be safe to uninstall the old Postgres copy. Do projects matter for IT? Short answer: not as much as many believe. Information technology (IT) focus is shifting from classical projects to agile services. Here’s why. A classical project has a predetermined start, end, work breakdown, and result. When done, the result goes into “maintenance mode”, and you jump to the next project. But what if something never has a “maintenance mode”? What if a work breakdown is impossible to know? For example, the web is never done. A university’s web site must be exciting and work quite well; the key audiences are technologically progressive prospective and current students. What university wants technophobic students? Relevant university sites must keep up with rapidly evolving consumer technologies. A university’s web site is a good example of an agile service: an adaptive mix of agile applications and expertise. These are where a lot of IT’s attention is going. Agile services don’t end. They are not classical projects. Isn’t a service just a lot of mini-projects? And isn’t the latest trend to make projects smaller? Neither matters much. Small projects are really large tasks or iterations in an agile service. By themselves, small projects don’t tell the value of IT. Agile services do. The largest classical IT projects are implementations. Virtualization and especially clouding make it easier to create new things, sometimes minimizing implementation projects into simple tasks. Without huge implementations, the focus shifts to maximizing value of existing investments. Again, emphasizing agile services at the cost of classical projects. Classical projects use waterfall, a prescriptive method from the manufacturing and construction industries. It’s from a time when the pace was steady, change was resisted, and top down was how it happened. Relevant IT is the opposite: fast-paced, adaptive, and responsive. That’s why agile management is natural for IT: it encourages adaption, continual reassessment, early problem discovery, and faster completion. But this isn’t just about improving how projects are done. 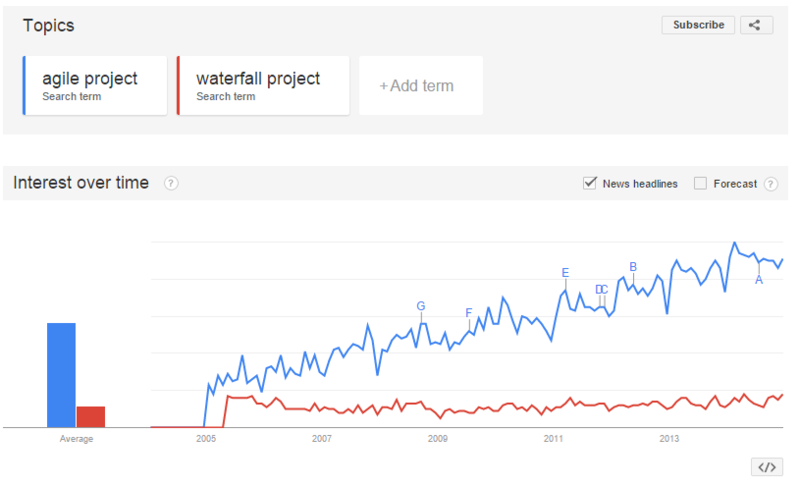 Agile does something that waterfall can’t: manage services. Do classical projects belong in IT? Classical projects still have a place in relevant IT. We will still have cookie cutter projects with well-understood paths and vanilla outcomes. However, “well-understood” and “vanilla” and are being outsourced, such as email, web systems, ERP systems, and more. If not outsourced, they may be “keep the lights on” , undifferentiated from plant operations. Or their business value is not intrinsic; the value is in what others—users, innovators, developers—can wring from them. Agile services are the future of IT. It’s how relevant IT works, it’s how relevant IT provides business value, and it’s how relevant IT communicates what it does. Posted on December 10, 2014 April 13, 2019 Categories TechnologyLeave a comment on Do projects matter for IT?